June abounds with the birthdays and anniversaries of so many friends and family. So as we go through the month celebrating all of you, I’ll think about all the laughter and pleasures we’ve shared over time and look forward to more. These beautiful irises are now planted in our front yard, the kind gift of family members with seriously green thumbs. When we moved to our new home three years ago, we left behind a garden that had taken years to develop, filled with all kinds of flowers and foliage, shrubs and trees. I do miss my irises and my peonies and my magnolia tree and my climbing vines and all the rest of the plants I carefully researched, selected and planted. I miss my quiet and soothing vine-covered meditation garden, my water feature and my granite bench. But that was then. This is now. It’s time to start again…We began to plant and landscape last year and we added a plum tree, a ginkgo, lilacs and an espaliered apple tree. We planted blueberry and currant bushes and rhubarb. And our vegetable garden will be full of healthy brightly coloured vegetables just as it was for the past two years. We continue to develop our outdoor space this summer. 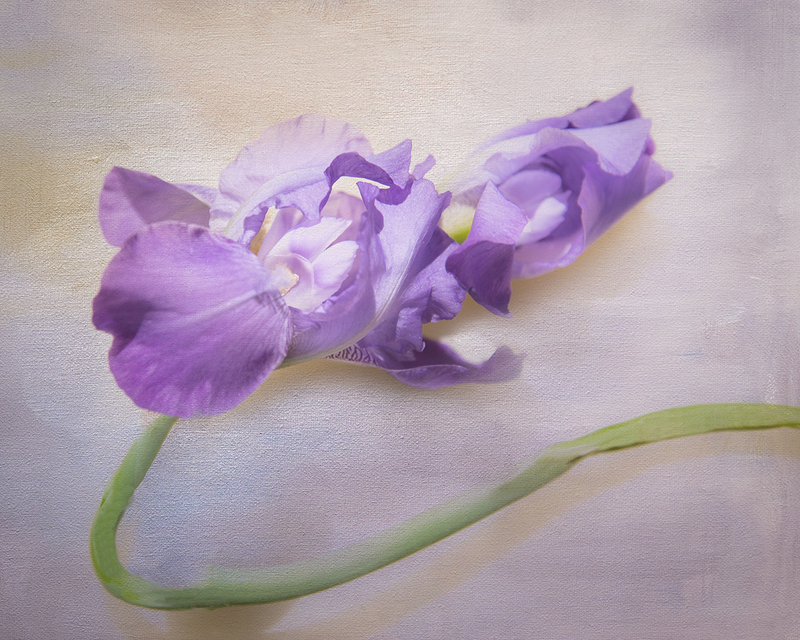 I’m yearning for more flowers…but they will come…and the irises are a great beginning. Sounds like you will be keeping busy this summer! Your Iris is a beauty and a lovely start to your garden! Iris are such beautiful and complex flowers and the colours go right to my heart. Yours is such a soft, delicate colour. It sounds as if you have big and exciting plans for your garden this year! Heartfelt thoughts, Sherry, and what a beautiful photograph this is. Thanks for visiting my blog…I love that we share a lot of the same interests…Grace, yes, it is good…have a beautiful week..
That is a beautiful iris … and you’ve shared beautiful thoughts! Pulling up roots is never easy but I think for gardeners, it is a more painful task. Enjoy your summer home and your fun task of planning a new garden space!